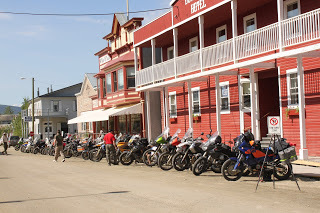 We are resting in Dawson City today. 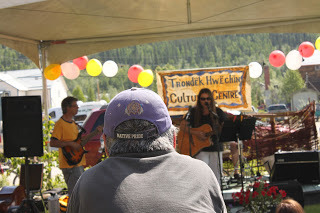 We putzed around this grand city of the Gold Rush era, chatting with folks, listening to music, watched more riders roll in for the start of D2D tomorrow, and enjoyed the music at the tr’ondek hwech’in heritage center in celebration of Aboriginal Day. 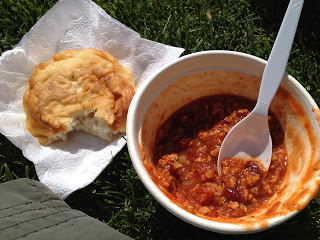 We sat on the lawn and ate bannocks; very similar to Navajo fry bread in the southwest. The music was pretty decent, and I kept commenting on how more contemporary the native music is in Dawson than in Alaska. Canadians recognize National Aboriginal Day (well, most do) as a day to honor the First Nations. amerika does not have a nationally recognized day set aside as a Federal holiday for natives, however the second Monday of October annually marks Columbus Day in many parts of amerika but not all states follow this observance. Instead, they celebrate other events on the day. For example, South Dakota’s official holiday on this date is Native American’s Day (also known as Native American Day), while people in Berkeley, California, celebrate Indigenous People’s Day. We met Wee, a dual-sporter up from California doing a solo trek to Anchorage round trip. 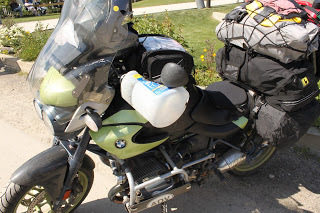 He was sporting a nice hand guard set that he jury-rigged up along the way to protect his hands from the bugs. He was a nice fellow whose wife was tracking him using his Spot. Aside from Spot, he was technology free, and I got the feeling that although this was not ideal, he was enjoying the break. 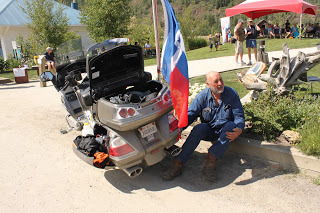 We also met a fellow that put a Texas flag on his bike when he left Dallas and it was shredded to less than half its original size from the wind. We wondered if it would make it to his final destination: Prudhoe Bay. He informed us that he had a second flag for the return trip. Got to love that wind drag from Texas! The sun shone all day and we had to fight the urge to just sit still and soak in the rays. Don’t get me wrong, we did a lot of that too. 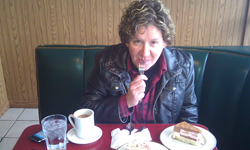 I also booked a Thai massage tonight, and we plan on getting dinner at the Drunken Goat Taverna – a left over must-do from our last trip in Dawson. We sat around and drank cappuccinos at Riverwest Coffee and noted how timid the dogs in Dawson seem to be. They shy away from us, but of course it could be the road stench? Bike after bike rolled into town filling the streets with geared up diehards congregating underneath the Downtown Hotel. I looked around and saw maybe two women present so far in about 150+ men. Dual sporting seems to be one of those areas that women are still crossing into. We can’t help but feel like we have stumbled into a British movie. There seem to be a lot of Brits in town. Everywhere you go you see a Brit (not the usual German). While having dinner at the Drunken Goat, we sat at the bar and were soon joined by two older British couples. Dottie (“call me Dot” for short) stuck to us like a magnet; she thought we were, “lovely biker women” and wanted to know all the details of our adventure. At some point her hubby came over and warned Jaz not to corrupt his wife. I think Dot wanted to be corrupted. Tomorrow we hit the road for Whitehorse with a possible detour to Keno. Another British couple staying at the B&B with us warned us to not go to Keno. We were told the road was too dangerous to do by motorbike and that it was only passable by 4-wheel drive. We both decided they were stuffy Brits and we needed to check it out for ourselves to see if it’s true. I’m good with dirt. Let’s leave the call to Jaz tomorrow. The bannocks and chili look really good right now. Have a nice day off!